Since we moved out into the ‘burbs of New Jersey, James and I have had sort of a weekend tradition going on. We go to breakfast at Panera Bread, usually on a Saturday. Now don’t get me wrong – I love nearly every single thing on Panera Bread’s menu – but I had never really settled on a “go-to” breakfast item until a few weeks ago when I suddenly noticed the baked egg soufflés in their baked goods case. How I missed these before, I don’t know. But they are, as far as I’m concerned, breakfast perfection. My favorite is the Ham and Swiss Baked Egg Soufflé. The right amount of protein, plus the sweet flakiness of croissant? P-E-R-F-E-C-T. It kind of bums me out that you can only get these little eggy baskets of win for breakfast. I’d love to be able to get them for dinner too. That’s when I decided to try and make them at home. Last Saturday, I set out with a copycat recipe created by author Todd Wilbur for Panera’s Spinach Artichoke Baked Egg Souffle. Not being a fan of artichokes, I knew I had to recreate the Ham & Swiss version if I could. For the Brit’s soufflé, I added extra black cracked pepper and minced fresh red pepper. As he devoured his breakfast about half an hour after I started out, the words “perfection”, “glorious”, and “magnificent” left his lips around rather large bites of food. I don’t think he was even talking to me, but to the soufflé in his hands. I think he might just be a fan. We still love Panera’s version, and won’t be leaving behind our weekend breakfast traditions any time soon, but now I can have my Ham & Swiss Baked Egg Soufflé for dinner if I want too. That makes me one happy camper. I think you’ll love them too. You can add anything you want to the egg mixture. Think of it as an omelet inside a croissant, if you want. The ingredient world is your oyster, my friend. But try Ham and Swiss at least once. It’s a classic combination for a reason. Mix 3 eggs, milk, and heavy cream in a large plastic or glass mixing jug until well combined. Egg yolks should be completely broken and mixed in. Add shredded Swiss cheese, Parmesan, and salt and mix again until thoroughly distributed throughout the egg mixture. Microwave the egg mixture in 30 second increments on high, stirring after each increment until you have a sort of solid, slightly runny scrambled egg mixture. In my 1000 watt microwave oven, this took 4 increments of 30 seconds. This tightens the eggs enough so that the dough at the bottom will cook, and the dough at the sides and top will not fall into them. Add diced ham, black pepper and red pepper (if desired), stirring through the egg mixture so evenly mixed throughout. Set aside. Sprinkle a clean surface with flour, and unroll the crescent dough. Do not separate the pairs of triangles. Instead, pinch with your fingers along the seam so that 2 triangles become 1 square of dough. You will only use 4 out of the 8 triangles included in the tube of dough. Set aside leftover dough, do not discard or pinch together. Flour the square of dough on both sides, and a rolling pin. Roll out the dough, turning dough once clockwise after each roll. Always roll in the same direction, directly out from yourself, until you have a square that is approximately 6″ x 6″. Melt about a tablespoon of butter in the microwave. Brush melted butter inside two 4″ ramekins, and then carefully line each with the 6×6 square of dough, leaving excess hanging over the edge of the ramekin. Fill each ramekin and dough with equal amounts of egg mixture. Sprinkle with more Parmesan cheese, if desired. Fold dough over the egg mixture so it is no longer hanging over the sides of the ramekin. Break and whisk the remaining egg, then brush over dough in each ramekin. This will give the dough a golden color and shine as it bakes. Place ramekins on the center of a baking tray lined with parchment paper. Bake for 15 minutes. While the soufflés are baking, roll the remaining crescent dough to package specifications. After 15 minutes, remove tray from oven and place the spare rolled crescents onto the baking tray around the ramekins. Return to oven and bake for 10-12 minutes more, until the souffles are golden brown and bubbly, and egg appears to be solidly cooked. The remaining crescents may need a few extra minutes, so remove the ramekins from the tray and return the tray to the oven, if necessary. Allow the soufflés to cool for approximately 5 minutes. 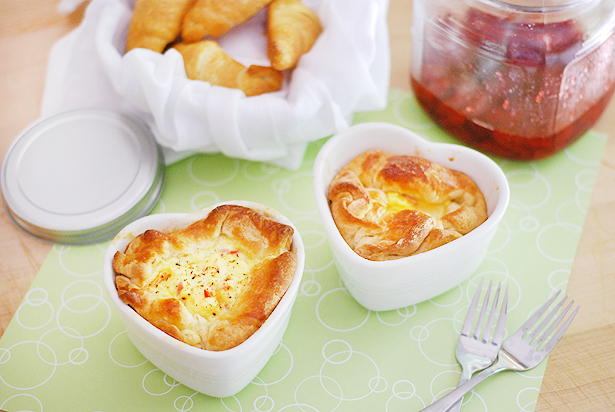 You may eat the soufflés directly in the ramekins, or remove them and serve on a plate. They should remove easily since the ramekin was brushed with butter. Serve with extra crescents, jam, and fresh fruit for an excellent Saturday morning breakfast or weeknight Brinner! 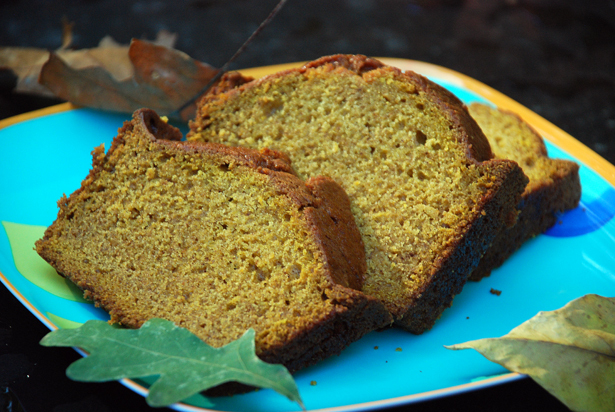 I’ve never had Panera, so I am excited to have a chance for at least the DIY version. I have a sad tale for you btw, the DH will NOT, I repeat, WILL NOT touch an egg! I can one up on you on that one, honey. My husband hates cheesy sauces, and any block cheese beyond cheddar. Oh my goodness you weren’t joking were you. I’m soooo in love with this idea! 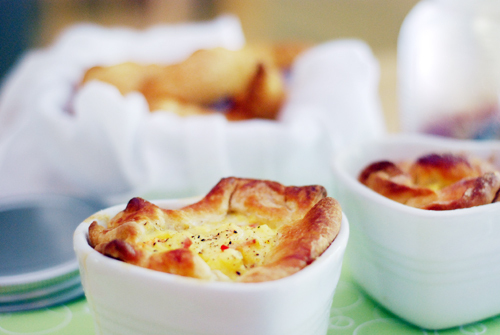 I love their baked egg souffles, I can’t wait to try this recipe. Thanks, Amber! I’ve yet to have the pleasure of eating at Panera Bread, but my Dad talks about it all the time! Now I can have it at home. These look super fantastic! Mmmmm! Yummy! I will have to try these. They remind me of an item we used to make in Culinary School. We’d take croissant dough and place ham, gruyere, bechamel and spinach in the center and fold the dough over. It was amazing. Can’t wait to try this! I have never actually had the souffles at Panera… But, now I don’t need to! Love the look of these… They are just beautiful! I have never had a Panera Egg Souffle, but now I am tempted to wake up early tomorrow to go get one. These look insanely delicious. Love the photos too. This looks like breakfast heaven to me. I wish we had KerryGold around here. And I agree that ham and cheese is the best combo! So beautiful, Amber! The photos are perfect. And the souffles look creamy and flaky. oooh, I LOOOOVE the egg souffles at Panera!! thanks Amber these look fantastic!